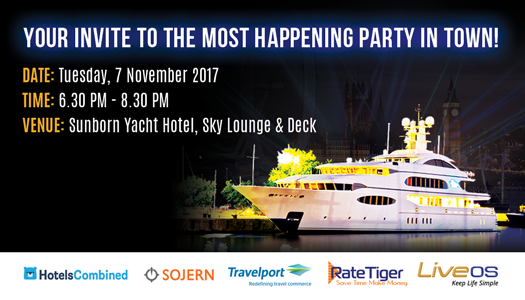 Hotel technology experts HotelsCombined, Sojern, Travelport, RateTiger & LiveOS have teamed up to host an exclusive yacht party for hoteliers on Tuesday, 7 November 2017 in London. The event, to be held at the Sunborn Yacht Hotel, will bring together peers from the hospitality industry to unwind and network over cocktails. The event is aimed at providing hoteliers and technology companies an interactive platform to exchange ideas and explore collaboration possibilities. The luxurious Sunborn Yacht Hotel is located right outside the ExCel centre, providing a perfect venue for the networking reception after a busy day at the show. 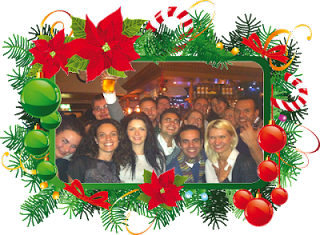 “We are excited to be organizing a networking reception with some of our key partners. WTM is an important date in the annual calendar for the travel fraternity and it gives us a perfect opportunity to host our clients, partners and prospects, to talk about new technologies and explore collaboration possibilities, and most importantly, spend a fun evening together,” commented Reuel Ghosh, Chief Executive Officer, eRevMax. eRevMax has been a regular exhibitor at WTM London and will be present at Stand TT550 from 6 – 8 November 2017. For more details about the event, please contact marketing@erevmax.com. On Monday 3rd September the Boutique Hotel News held a panel discussion to review the effect of the Olympics and the results for Independent and Boutique hotels during the period. Held at The Hempel, the session looked at what can be learned from the London Olympics and what to expect over the next 12 months. The London Olympics 2012 is about the long game; promoting and reintroducing Britain back to the world, building the profile of the country across the world. The panel noted that it drew the best of Britain through the media, that was replicated across the world. The mass number of volunteers demonstrated the country’s hospitality and the ability to be welcoming hosts. The panel noted how boutique properties are good for hospitality events with the right amount of space (40-60 rooms) that adds character and history of London through the original building structure that feels historically different. The underlying theme though was to truly understand what the customer wants from you! With thousands of hotel room nights opening in London that have more luxury capacity and as the Olympic spotlight fades hoteliers need to begin being creative rather than taking everything for granted. 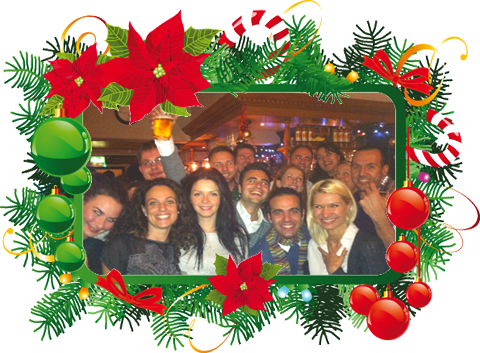 Boutique hotels will need to work hard and be very smart and creative otherwise 2013 will be a difficult year. The UK has had its fair share of international events over the past couple of years with few to come except the Rugby World Cup 2014. As hotels in the UK will need to market rates inclusive of VAT, at 20%, the country may start to look expensive, especially to Europeans with the low value of the Euro. The panel talked of the year of 2013 that has little to look forward to. More budgeting, people needing to work harder and hotels to find those hidden gems and stories. The industry will need to look closer at the potential of providing a more personalized experience. By 2014 the country is expecting an additional 4.5 million visitors, a commitment made by VisitBritain. For the hotels, OTA is a dirty word as direct sales are more profitable. However OTAs are needed in January, February and Sunday nights. The Town Hall Hotel works with the Kiwi Collection, Mr and Mrs Smith and other very specific boutique brand agencies, doing the marketing on their behalf. Marie said she works hard to qualify whom they work with and there is a growing understanding with consumers that the best rate is a direct rate with the hotel. For working with the large OTAs like Expedia and Booking, for them it is a listing, to be on the hotel search engine, but keeping an optimum price on these channels positions them correctly in the market. As for Social Media, Ruth believes it is great if using it for the right reasons. Some for specials, some quick enquiries, some as communities. Such an individual aspect for each business it needs to be considered on how it works best. There’s a lot more to come from the Olympics, if hotels, the country and everyone works hard enough to bleed as much from the international profile gained as possible. HOSPACE is the annual conference and exhibition hosted by HOSPA (formerly BAHA) – the UK’s leading educational organisation for hospitality professionals. The event took place on 24th November 2011 in UK and saw approximately 400 delegates attending it. The event opened with an overview of the industry and the upcoming Olympics, post which it moved on to a panel discussion on key issues, trends and developments facing Finance, Revenue Management and IT professionals followed by the Hospitality IT Debate and a Revenue Management Session. There were some educational workshops lined-up as well. My colleague Casey Davy did a presentation on Online Distribution and Channel Management which was very well attended. Overall it was a very successful show as the turnout was great. It was a good mix of suppliers including hotel technology and the buyers which comprised of large hotel groups as well as standalone properties which made it more interesting. Not only did the event receive excellent feedback from all exhibitors, but the delegates too shared positive reviews and found it a worthwhile platform for business.